There’s no question that Under Armour (UA) is a rapidly growing company, and that growth looks tantalizing for investors. However,look at the stock’s current and historical valuation shows UA might be in a bubble. At the very least, Under Armour will have to continue its rapid growth pace for the next several years for investors to realize any upside in the stock. This looks to me like a somewhat risky bet, given how much of the stock price is based on confidence. While an investor looking to hold the stock for the next ten years may not worry about this, investors with a shorter time horizon or less appetite for risk might want to stay away. First, let’s take a look at UA’s growth using Stock Rover. Over the past five years, average annual EPS growth has been 30%, which is pretty impressive (see chart below). However, that growth rate has been declining to a 25% average over the past three years and a 20% growth rate in the last 12 months. However, this has more to do to with acquisitions than declining sales, as the annual sales growth average has remained steady in the high 20s. This latter piece of news is a reassuring sign. 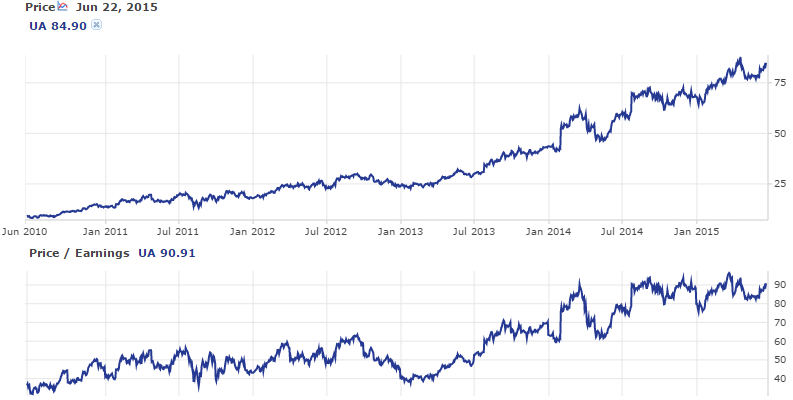 When we look at UA’s valuation, the numbers are similarly large. The P/E of 89 is massive, though next year’s excellent projected EPS growth of 32% is expected to cut next year’s P/E down to a less stratospheric 60. The P/E to Growth Forward ratio (PEG Forward), which divides next year’s P/E by estimated five-year growth projections is 3.3, is also pretty high. Now let’s take a look at how UA’s current ratios compare to the company’s history. Looking at valuation metrics over the past five years, we see the company is close to record highs in all of them: P/E, P/S, Price/Book, Price/Tangible Book and Price/Cash Flow. This could mean two things: either investors are bullish about UA’s future growth and have a higher tolerance for large multiples, or that UA is in a bubble because it’s valuation is out of whack with what it has been historically. Since UA’s growth is so highly priced into the stock, and the stock’s valuation is near historic highs, the stock could take a tumble if the market loses confidence in Under Armour’s future. We can see graphically that in recent years, much of the appreciation in Under Armour’s share price has correlated to P/E growth. This means that share price appreciation isn’t being fueled by current returns, but by the prospect of future returns. Again, this momentum could be a result of warranted investor confidence in Under Armour, or it could be a sign of overconfidence and a bubble. Let’s calculate P/E going forward, assuming the current share price and a 25% annual EPS growth rate, the average annual growth UA has had for the past three years. Going off estimates for 2016, we get an estimated 2017 EPS of 1.76 for an EPS of 48. Our estimated 2018 P/E is around 39, 31 in 2019 and 25 in 2020. Using a more generous assumption of annual 30% growth that UA has averaged over the past five years, we get a 2017 P/E of 46, a 2018 P/E of 35, and a 2019 P/E of 27. A P/E is in the 30s seems reasonable for a stock with growth potential like Under Armour’s. If we use a conservative estimate of 20% annual growth, the stock wouldn’t hit a P/E in the 30s until 2019. Let’s also project Price/Sales going forward. Current Price/Sales of 5.7 are much higher than the apparel manufacturing industry average of 2.0 or the S&P 500 of 1.9. When we project that ratio forward estimating 30% annual sales growth, we see a 4.4 P/S in 2016, 3.4 P/S in 2017, and 2.6 P/S in 2018. Keeping current share price constant, Under Armour’s growth won’t shrink these P/E or P/S ratios to more normal levels until 2017/2018. Since the market expects UA to maintain its 25-30% annual earnings growth rate over the next 2-4 years, we can think about a position long UA as a bet on the company’s annual growth rate exceeding that rate over the next 5-10 years. Since it will likely take about three years for Under Armour’s growth to move valuation into a more normal range, the period after that is where investors could expect to earn some upside for their patience. Let’s take a look at Under Armour’s business to see if that growth can continue. Under Armour has plenty of room for sales growth in both domestic and international markets. The company is expanding its retail outlets in the US, as well as growing its online retail sales. The company just opened a store in Brazil, and international net revenue increased 74% in year over year in the last quarter. Some of Under Armour’s sponsored athletes – Steph Curry, Jordan Spieth, Tom Brady – have turned in championship performances recently, which has translated into some bullishness on the brand, though I wouldn’t let a few championships this year drive my decision to buy. The company has new sneakers in the pipeline, though some bearish analysts point out the company doesn’t hold any patents on proprietary fabric technologies. I think there’s enough uncaptured market share for UA in the US, abroad, and in new sports like hockey that they can continue to grow for awhile, though maintaining a 25-30% pace gets more and more difficult the larger the company gets. There are also some areas of the business that are not so positive. Under Armour is not very good at generating free cash flow in relation to either share price (see free cash flow yield) or as a percentage of sales (see below), and those numbers are getting worse. While the company’s balance sheet is generally in very good condition, long term debt has been increasing recently to fund the company’s acquisitions of digital fitness apps. The idea is to integrate fitness tracking into the Under Armour brand, and is admittedly a long-term project. Further, margins have been flat the past few years, as have returns on capital (see chart below.) This doesn’t mean Under Armour can’t continue to grow, but I expect that growth to come from increased sales, not from increased efficiency. Because growth potential is so strong and market expectations are so high, Under Armour is a high-risk, high-potential-reward play. I think the company is more likely to meet expectations than not, but if growth slows for some reason, the share price has a lot of room to fall. The current share price is so high that it will take several years of solid growth to bring P/E down to a more moderate level. After that, in the 5-10 year term, Under Armour could be a great opportunity for growth investors to get in on a future behemoth.